VIA’s SNOW TRAIN EXPRESS to JASPER, A new way to get to Jasper’s winter wonderland! VIA Rail Canada in partnership with Marmot Basin and the town of Jasper, Alberta is proud to announce a new seasonal departure from Edmonton to Jasper using VIA’s fully-domed Panorama cars. 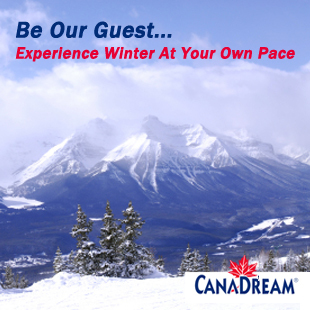 For 15 weeks, from January 12th, 2007 to April 22nd, 2007, skiers, snowboarders and outdoor enthusiasts can ignore the weatherman’s stormy predictions; leave the winter driving up to VIA and travel care-free from Edmonton to Jasper, and vice-versa, in comfort and safety. Travellers can make the best of both worlds combining a trip on VIA’s Snow Train Express with the award-winning Snow Train to Jasper (The Canadian), voted the Best Winter Product by the Canadian Tourism Commission. One-way fare for VIA’s Snow Train Express is $123.00 (CDN). 6% GST applies. All regular tariff prices will apply for seniors, students and children. Don’t ski? – no worry – the magical winter town of Jasper offers visitors a multitude of activities to choose from. Stroll down Jasper’s quaint downtown area, sip hot chocolate whilst nestled in the carriage of a horse-drawn sleigh, go on a magical ice-walk in the Maligne Canyon, marvel at the breathtaking view of Mount Edith Cavell as you stroll along Lac Beauvert situated in the complex of Fairmont Jasper Park Lodge, or simply enjoy the natural splendour of Canada’s Rockies in picturesque Jasper. VIA’s Snow Train Express and the Snow Train to Jasper make all this and more possible.